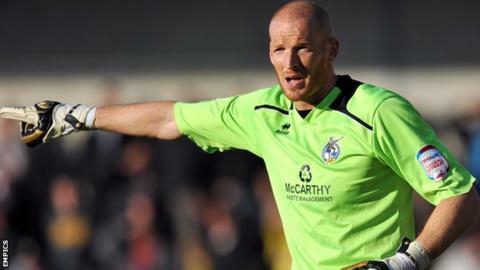 Bristol Rovers goalkeeper Scott Bevan's career could be in jeopardy if he undergoes a second wrist operation. The 33-year-old played with the problem last season before being told he required surgery over the summer. He was expected to be out for three months, but has yet to make an appearance this term. "He's still struggling and very soon we're going to have to make a decision," manager Mark McGhee told BBC Radio Bristol. "He's either going to have to accept that it's never going to be 100% and get back out to do what he was doing last season, which was playing with a strap. "Or he's going to have to face up to another operation, in which case there is no certainty he would ever play again. "We are very concerned about his situation. Clearly it's gone on way beyond what I expected." Bevan followed former Rovers boss Paul Buckle to the Memorial Stadium from Torquay in 2011 and played 42 games last season. McGhee brought in Chelsea's Sam Walker and Fulham's Neil Etheridge as loan cover following Bevan's injury. Etheridge has since established himself as first-choice keeper and has extended his stay until Christmas.